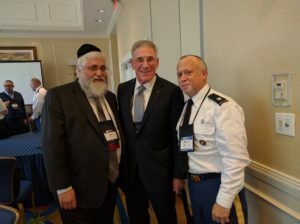 Rear Admiral Rabbi Harold Robinson, Lieutenant Colonel Rabbi Shmuel Felzenberg, Abe Halberstam, Founder Labriute Meals. I was honored to have been invited by Rear Admiral Rabbi Harold Robinson who is both the Director of the JWB as well the Director of Armed Forces and Veterans Services. The meeting was a rare opportunity for me to meet and thank the chaplains that support Jewish soldiers in every branch of the military and…in every base around the world. 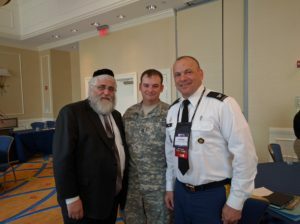 In addition to their spiritual and personal guidance, our brave Chaplains ensure that Jewish soldiers have access to kosher meals, as Labriute is the exclusive kosher meals supplier to the US Military. Chaplain (Col.) Carleton Birch, DLA Chaplain, U.S. Army, Staff Sgt. John (J.B.) Edmisten, Chaplain NCOIC, U.S. Army, Abe Halberstam, Founder Labriute Meals. Coming on the heels of “Operation Passover”, Labriute’s annual shipments of Pesach meals to all of our Jewish troops, it was gratifying to know that many of our soldiers were able to enjoy a kosher-for-Pesach meal even in remote areas. I want to thank all of the incredibly dedicated and brave Chaplains for their service and for their invaluable input that will help Labriute continue to serve our troops with military kosher meals. Previous Previous post: Food. The right kind of fuel, especially when you’re on-the-go or away from home.